St. Martin's Press, 9780312280581, 416pp. With a loyal viewership in the millions, ten successful seasons on PBS, and five immensely popular cookbooks to her name, Mary Ann Esposito is America's favorite Italian cook. A former school teacher who studied with chefs across Italy before posing the idea for "Ciao Italia" to her local public television station, Esposito brings traditional Italian cooking to life with her down-to-earth approach, warm personality, and good humor. Ciao Italia--Bringing Italy Home ties in with the show's eleventh season, which will air on more than 150 public television stations across the country. The series--and the book--will take fans on a culinary tour of Italy, region by region, with all-new recipes, personal reflections, and Mary Ann's unique warmth and style. Chapters cover the Veneto, Emilia Romagna, Tuscany, Campania, and Sicily; also featured--and never before published anywhere--are viewers' most-requested recipes, and specialties made by guest chefs on the program. TV chefs come and go, but Mary Ann Esposito has established herself as a standard bearer who appeals to every segment of the American public--men and women, adults and children, seasoned cooks as well as novices. Join her "nella cucina" (in the kitchen) for her most exciting and ambitious cookbook yet--a mouth-watering tribute to her ancestral home, her loyal viewers, and the amazing gift of great Italian food. 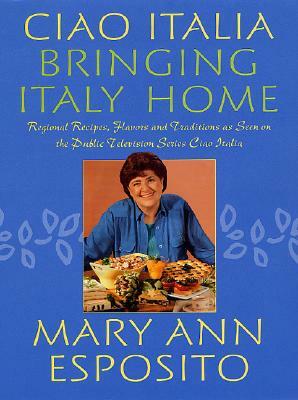 Mary Ann Esposito is the author of five previous cookbooks, which have sold more than 400,000 hardcover copies combined. She lives in Durham, New Hampshire.